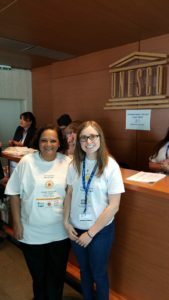 Prof. Chitra Rangan and Queens University Student Kate Fenwick at the IDL in Paris, France. CAP Member and Queens University graduate student Kate Fenwick is in Paris, France representing Canada at the International Association of Physics Students delectation at the UNESCO International Day of Light Celebrations. She is joined by fellow CAP Member Prof. Chitra Rangan, University of Windsor who was the Canadian coordinator for the International Year of Light in 2015. Click here to read the full University of Windsor media release. The Kingston Whig-Standard interviewed Kate and Prof. Chitra Rangan before they left for Paris. You can read the full article below and on the Whig-Standard’s e-edition. Queen’s University graduate Kate Fenwick will be representing all of Canada while attending the United Nations Educational, Scientific and Cultural Organization (UNESCO) International Day of Light in Paris on Wednesday. Fenwick will be acting as the Canadian representative for the International Association of Physics Students delegation, sent by the Canadian Association of Physicists. With the first International Day of Light, Fenwick now has the opportunity to work alongside physicists working in the field and students from all around the globe, with approximately 25 students attending from 17 different countries. Well on her way to obtaining a master’s degree in physics, Fenwick also has a passion for showing the community as a whole just how important light and laser optics are to a growing society, and how the research can be used for a brighter tomorrow. Science and industrial leaders, educators and diplomats from around the globe will be gathering Wednesday to consider how lightbased science and technology can aid in obtaining the goals of education and sustainable development in Paris. Chitra Rangan, a physics professor at the University of Windsor and a member of the Canadian Association of Physicists, is the chair of the steering committee for International Day of Light Canada, said it is important to not only educate people on how involved light is in everything we do, but to show them how much of an asset it can be for our future. Chitra also makes it clear that anyone in any field can make a difference with this research and that the International Day of Light doesn’t start and end with physics research. “You use light in almost every subject: chemistry, biology, computer science, socioeconomics. It’s huge for development. We encourage students to think about developing light in a holistic way, and to see how they can make a difference in the world, with whatever path they may choose,” Chitra said. The International Day of Light also doesn’t just appear in Paris. Canada will also be hosting its own event in Ottawa on Wednesday at the STEM expo, and will host a variety of events and students from across the nation.